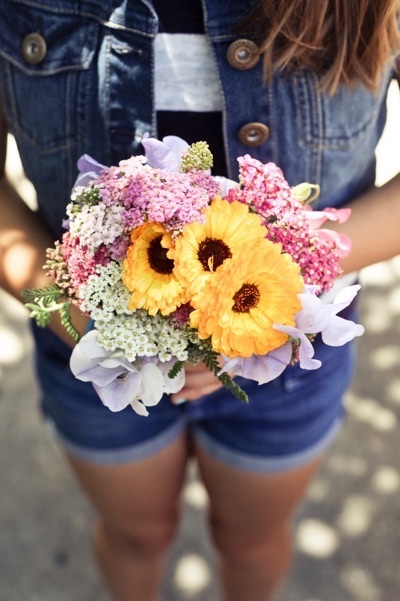 Learn to make beautiful flower bouquets at a July 29 workshop. Photo by Carolyn Lagattuta. The public is invited to attend an afternoon of gardening workshops on Saturday, July 29, as part of the "First 50 Celebration" of the UC Santa Cruz Farm & Garden. The festivities highlight a year-long celebration to recognize 50 years of UC Santa Cruz leadership in organic farming and sustainable agriculture. Workshop topics include pollinators in the garden; drawing in the garden; integrating blueberries, raspberries, and blackberries into the garden; youth empowerment and working with teens in the garden, and more. Workshops begin at 2 p.m. and 3:45 p.m., and will take place at the UC Santa Cruz Farm and the Alan Chadwick Garden. Instructors include staff of the Center for Agroecology and Sustainable Food Systems, as well as graduates of the Apprenticeship in Ecological Horticulture. The cost is $30 ($20 for members of the Friends of the Farm & Garden); the fee covers both of the afternoon time slots. Advance registration is recommended. Highlights appear below, with the full workshop schedule available online; pricing and registration information for the full weekend of events is also available online. • Youth Empowerment and Working with Teens in the Garden with Doron Comerchero founder of FoodWhat?! These public workshops are part of the "First 50" celebration of UC Santa Cruz's leadership in organic farming and gardening. What began in 1967 as a modest organic garden on a steep hillside above Stevenson College has blossomed into an internationally acclaimed, hands-on learning and research program under the auspices of the Center for Agroecology and Sustainable Food Systems. More than 1,500 people have graduated from the apprenticeship, and a growing number of UC Santa Cruz undergraduates are taking advantage of learning opportunities at the Farm & Garden; the Center's research program has led to breakthroughs in the organic production of key crops, including strawberries, artichokes, and apples. Sponsors of the First 50 Celebration include Earthbound Farms, Friends of the UCSC Farm & Garden, Sun Ridge Farms, Veritable Vegetable, Clif Bar and Company, Heath and Lejeune, Kingbird Farm, Lakeside Organics, Organic Valley, Simply Organics, Tend, and United Natural Foods (UNFI). It's not too early to mark you calendar for the annual Harvest Festival on October 1 from 11 a.m. to 5 p.m. at the UC Santa Cruz Farm.